Its been a wee while since we last had an update on the excellent Fallout Wasteland Warfare, but our friends over at Modiphius Entertainment have not forgotten about the game and need your input! Hey Vault Dwellers are you ready for 2019? We’ve got a lot of exciting plans so let’s get started! We need your help with an exciting new release for Fallout: Wasteland Warfare. It requires those who have the Fallout: Wasteland Warfare Two Player Starter set and time to get in at least a couple of playtests before the end of the month (though the more the better). There will be more elements to test in February onwards but the critical part is right now. Click here to sign up. Remember our Terrain Competition is still live, more info here. Due to late deliveries in to North American retail of the last three expansions we decided to extend the deadline until January 31st. As a result you may update your submission if you have already submitted and we will take your latest submission as the final. Final entries by 31st Dec will qualify for the Early Bird Judges Award. All final Wave 1 expansions were delivered to distributors who pre-ordered before Christmas. Some distributors didn’t order enough and with on-going demand we’re re-stocking all of Wave 1 through the Spring. Right now the Two Player Starter set re-stock has arrived and will be with retailers this month. 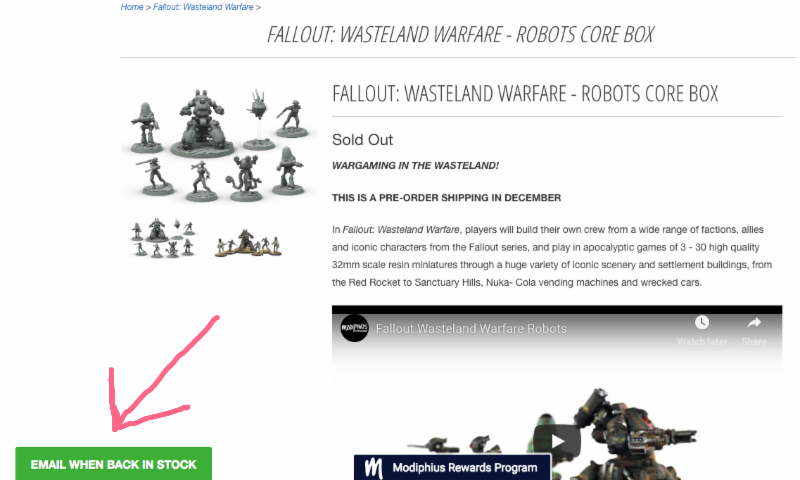 UK and EU retailers should get restock of the Super Mutants, Survivors and Brotherhood of Steel Faction Core Sets by the end of January. They’re on route to the US and should be available end of February there. In the meantime we’re working on more production of the seven expansions for each faction and will be re-stocking those from February onwards – a couple of sets each month whilst our US factory get’s ready. The very last of the delayed Scenic Sets are shipping for those who had to wait for replacement cards – all of those approx 70 outstanding shipments should have gone by end of next week. You can now buy items in our store from stock, so if something is showing out of stock use the ‘Email When Back In Stock’ feature. 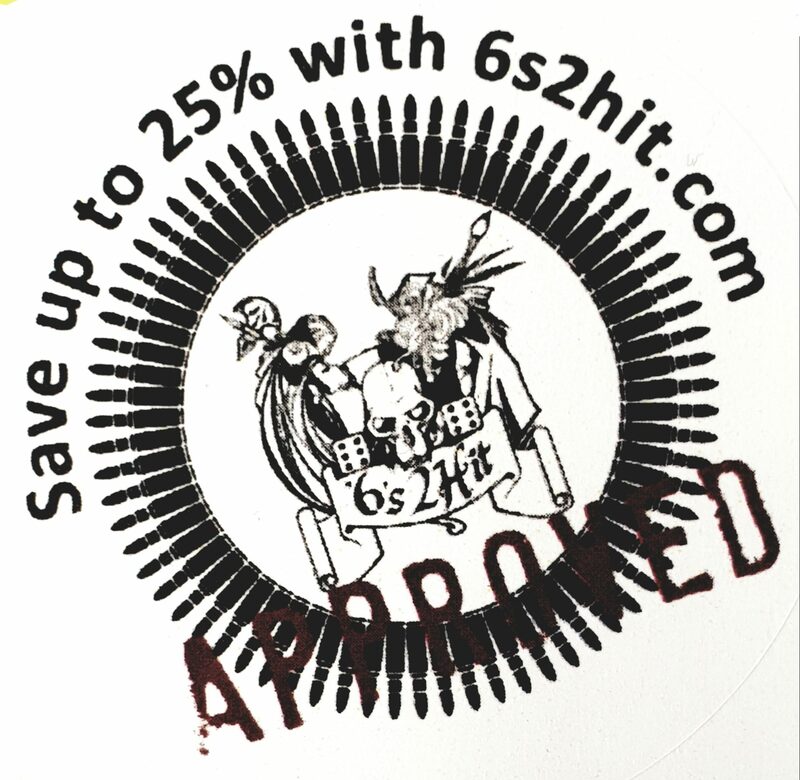 Simply add your email and as soon as new stock arrives you’ll be emailed. See the image below for where to click. We’ll be adding an updated Vault Tec bundle with just one Scenic Set and one Creature Core Set to make it easier to produce which will go live once the Scenic set stock is in, and you can expect all the major sets to be restocked over the coming months. That’s it for today, we’ll be starting to discuss Wave 2 soon, but in the meantime hope you’re enjoying the wasteland!